A couple of weeks ago with just 6 weeks to go until the Great South Run I searched the internet for a 6 week 10 mile training plan which I am now following. On the 3rd Sunday of the plan it recommended taking part in a 5K or 10K race. I was also spurred on by my performance in the Pride 10K– I knew I had it in me to set a new PB. 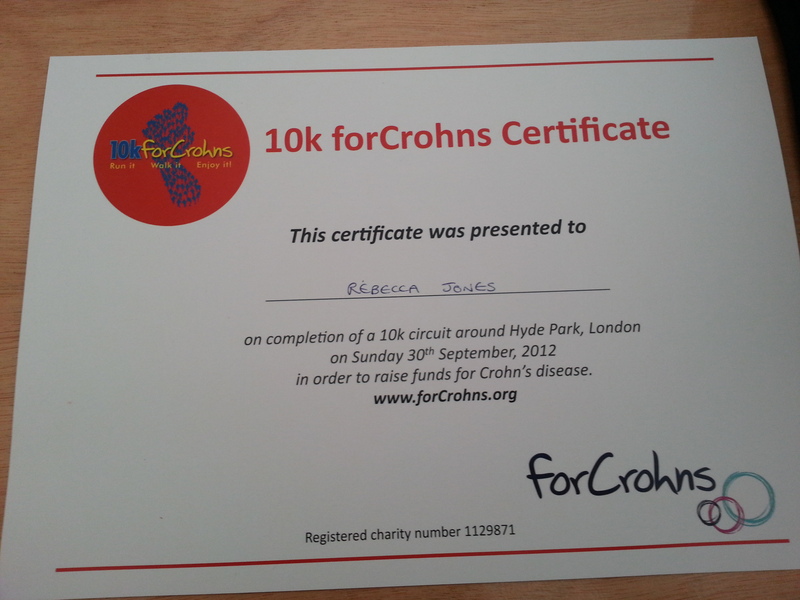 So again I searched the internet to see if I could find a 10K race in London to run on that date and found that the 10th Birthday For Crohns 10k was scheduled to take place in Hyde Park and was still open for entries. The event is an annual fundraiser for the charity which attracts around 250 people to run or walk the 10k route around Hyde Park. It cost £17 to enter which included a T-shirt and chip timing and they asked for a minimum of £20 sponsorship. I decided to sign up and 5 minutes later I was registered and thinking that with two weeks of focussed training I’d be sure to get a new personal best time. The day after I came down with a cold which lingered for around week and meant that I only managed to fit in a few training runs before the day of the race. Undeterred I made my way to Hyde Park on Sunday for the start of the race. The weather was good running weather – sunny with a bit of cloud and not too warm. 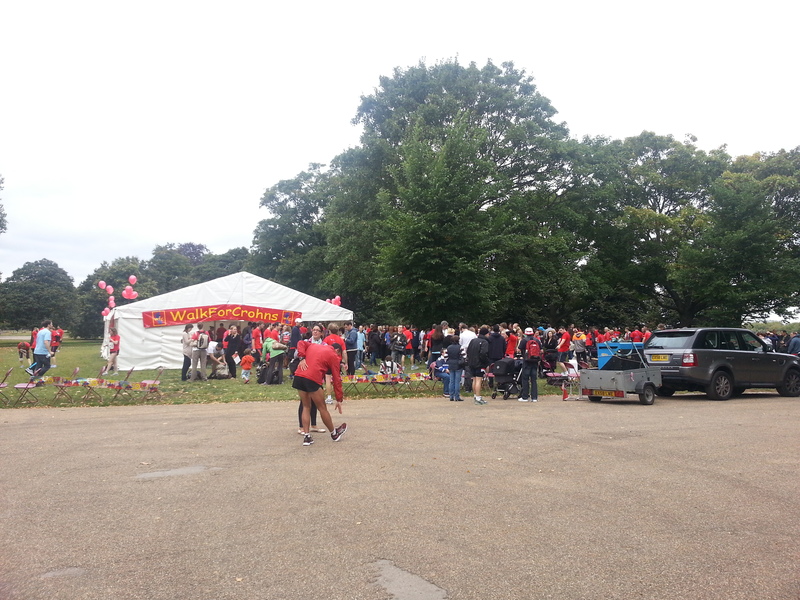 The start and finish area was located near the bandstand near the Serpentine. I registered, collected my race number with integrated timing chip and T-shirt – got myself prepared and drop off my bag. All very easy and slick organisation. At just before midday we were gathered together to do a short warm up and then we made our way to the start line and were off pretty quickly. 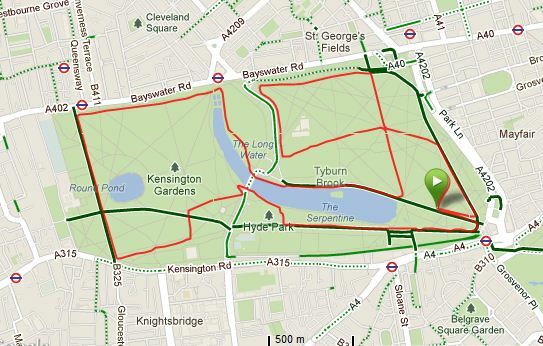 The route was lovely – around Hyde Park and Kensington Gardens. The paths were still open to the public so at times I had to negotiate walkers, cyclists, skaters, kids on scooters and the odd dog, but in general the paths were so wide that this really wasn’t an issue. The route was well marshalled with volunteers standing at every corner to make sure that we went the right way. My main focus for this race, as well as getting a PB was to try and find some consistency in my pace – not to go out so quickly that I then suffered in the last couple of miles. I didn’t set myself a target of not stopping to walk at all, I knew that I hadn’t done enough extra training to make that realistic so I allowed myself the odd walking break here and there when I needed it – focussing on the pace rather than whether or not I was running. This approach seemed to work. Although there is still a lot for me to work on in terms of consistency (my first mile was a minute faster than any of the others) I was plesaed that my 6th mile was within 10 seconds of my second. That’s something I’ve struggled to do before so it felt like a real achievement. I was even more pleased when I crossed the finish line in 1:11:24 – not a fast 10K in comparison to most other runners – but a minute faster than I have ever run – so fast in comparison to me! At the end of the race we were given certificates rather than medals – although I love my race bling it was actually nice to be given something different. I was invited to stay and enjoy the buffet that was being laid out, and listen to the band that was playing but I had been promised a roast dinner by Mr J so decided to head straight home after a few stretches. I thought this was a really well organised and friendly 10K over a lovely route through Hyde Park. The fact that people were walking the route as well as running made it a great race for anyone considering their first 10K run – thanks to the people walking there is no way that you would come in last which is something that often worries me! I’d really recommend it and hope to return next year. Congratulations on your new PB! It sounds like a very well-organised race and for a brilliant cause too. Thank you. Just found out they raised over £28K from the day which is amazing.